Last week we held our annual Klaveness Forum in London. The conference which took place at the Corinthia Hotel was well attended with many of our customers and partners. As part of the program I held a presentation on the key drivers for dry bulk freight in 2016 and 2017, which was followed by a panel debate moderated by John Kearsey (SSY) and with Aristides Pittas (Euroseas), Jeremy Palin (Arrow) and myself as panelists. Last year’s presentation focused on hope. In the sense that the emerging trend we saw at that time was 1) an improving Chinese real estate sector, 2) cuts in Chinese coal production and that 3) growing coal imports into Emerging Asia would continue into 2016. These factors have been positive drivers for dry bulk freight in 2016, however we had to wait until the last quarter of the year before we could tell whether those trends would lead to any meaningful recovery in dry bulk freight. Key trends in this year’s presentation were an improving growth rate in global industrial production and global steel production, a positive trend in the global coal trade and grain trade creates a solid platform for raw material demand in 2017. On the supply side we will see low fleet growth in 2017 and 2018 as the order book is very limited. In our base case we expect a fleet growth of 1.7% in 2017 and 0.7% in 2018. How low the fleet growth gets will to a large extent be a function of the freight market. We argue that scrapping, slippage and cancellations will be elastic to the demand growth. Effective supply growth will also depend on the speed of the fleet. Take the example from the Panamax fleet which according to our monitoring has been running at around 11.4 knots lately. 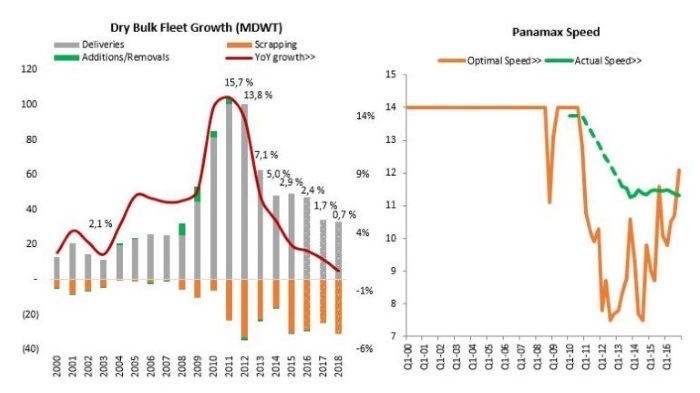 If freight increase enough to incentivize a speed increase (which also will be a function of bunker prices) then there is a latent supply increase through speed increase of about 16-17% if the fleet speed increases to e.g. 13.75 knots (assuming that 80% of the voyage days are at sea). Hence, if we experience some unforeseen demand shock then the potential of speed increases will slow down the pace of improvement in freight rates. So while we do expect the demand growth to outstrip fleet growth in 2017 we can forget about the freight rates seen in the hay days prior to 2011. 1) Will new ballast water and bunker fuel regulations have a material impact on scrapping in the next couple of years? The consensus answer to this was no. 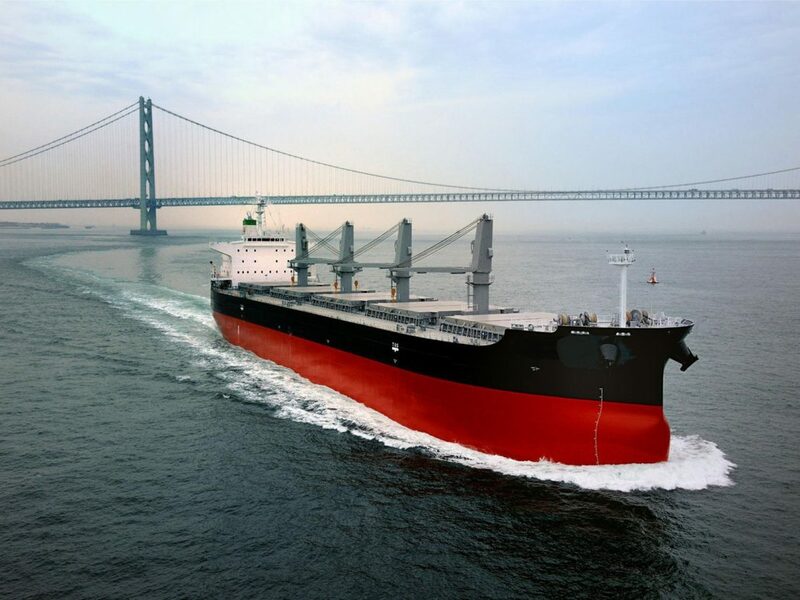 An investment cost of 4-500,000$ related to ballast water treatment systems will not be a decisive factor for whether or not you scrap a relatively young vessel of e.g. 15 years. Bunker fuel regulations will not impact scrapping in the next couple of years but may have an impact in 2019 if the implementation date of 2020 is maintained. It will also depend on whether refineries are able to produce enough low Sulphur fuel, in which case most of the cost will be transferred to the end user of the transported products. If scrubber technology is widely adopted, then the majority of the cost will be carried by the owners. If this is the outcome and the cost of scrubbers remain high than this can lead to higher scrapping, but only in a low freight market. 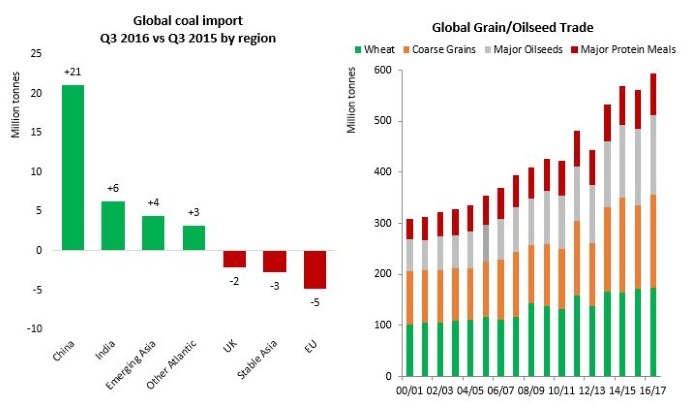 2) What will it take to revive dry bulk carrier ordering? The panel argued that with the current spread between new build and second hand prices it is very unlikely that we will see a substantial tick up in newbuilding ordering any time soon. I also argued that while the coal outlook in the next 3-5 years looks ok, the outlook is far more challenging on a 15-20 years’ horizon. Such an uncertainty should make potential investors think twice before ordering new vessels, or at least use a high discount factor on future earnings to reflect the risk when they make their investment decisions.